“The Great Migrant Con” says the front of The Sun. How can it be that the official migration figures released yesterday showed a ‘mere’ 257,000 EU migrants came to Britain last year; when on the other hand 630,000 EU citizens registered for a national insurance number, which would entitle them to work or claim benefits in Britain? Madeleine Sumption is director of the Oxford Migration Observatory. Research published in the British Journal of General Practice found that more than half of children diagnosed with asthma (in the Netherlands) whose records they examined had in fact no clinical signs of the condition. Professor Mark Baker is director of the Centre for Clinical Practice at NICE. The French government's plan to clear part of the Calais migrant camp known as the Jungle has been approved by a court in Lille. The BBC’s Tomos Morgan reports. "The BBC failed you when it should have protected you". That is what the organisation's director general said yesterday after an official report concluded it had failed to stop 'monstrous' abuse by Jimmy Savile because staff were too scared to tell their managers it was going on. But some argue it is inconceivable that nobody in the senior ranks of the organisation was aware of his conduct. 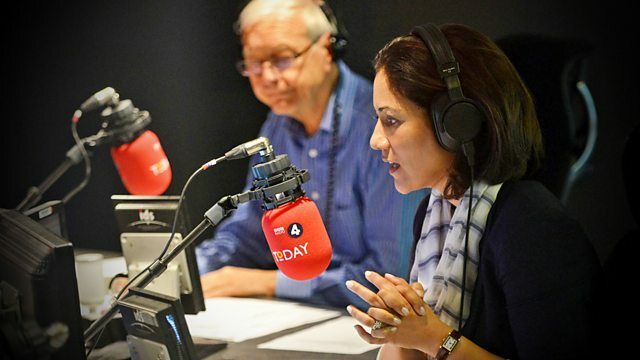 Today reporter Sima Kotecha has been speaking to Doreen Davies, a former boss at Radio 1 who worked closely with Jimmy Savile in the ‘70s and ‘80s. A few days ago Charles Moore told us in no uncertain terms why we should leave the EU. Now we hear an equally passionate and closely argued case for staying in. The editor of the Economist, Zanny Minton Beddoes, argues that the single biggest issue for her at stake on polling day is access to the European single market. At 7am Royal Bank of Scotland is expected to announce its eighth consecutive year of losses. Speaking on the programme is business presenter Simon Jack and Ross Mcewan, chief executive of RBS. Time magazine, one of America's most respected periodicals, has been forced to retract a claim that British novelist Evelyn Waugh was among the 100 best read female authors – given that he was in fact a man. Valentine Cunnigham is professor of English Literature at Corpus Christie College, Oxford. Michael Howard has announced he will be campaigning for Britain to vote to leave the EU. We speak live to the former Conservative party leader. Some argue it is inconceivable that nobody in the senior ranks of the BBC was aware of the conduct of Jimmy Savile. We hear from Doreen Davies, a former boss at Radio 1 who worked closely with Jimmy Savile in the ‘70s and ‘80s and former Radio 1 DJ Andy Kershaw. This week the final series of hit Channel 4 student comedy Fresh Meat launched to mixed reviews. Some critics say the 40-something writers of Peep Show Jesse Armstrong and Sam Bains are out of touch with the realities of being a student in the age of university tuition fees. Polly Bartleet is a final year Undergrad at the University of Manchester studying Music and Drama and Tim Loane is writer of noughties comedy Teachers. Today the Chairman of HS2 David Higgins has published his report on the economic benefits of high speed rail for Britain. We speak live to David Higgins. In recent weeks Russia has been involved in a particularly bitter battle of words with the UK. Consequentially, when our Moscow correspondent Steve Rosenberg travelled to Siberia to report on the Russian economy, he unexpectedly found himself becoming the story. Football's world governing body, Fifa, will get a new president today. Dan Roan is the BBC’s Sports editor. What does the Janet Smith review tell us about the way attitudes to sexual harassment and abuse have changed since the 1960s and '70s? Can what happened with Savile be explained by saying that the culture back then was different? Speaking live on the programme is former BBC presenter and founder of Childline Dame Esther Rantzen and Times Columnist David Aaronovitch.